"May, 1845, two ships under the command of Sir John Franklin sailed north to solve the last great problem in Arctic travel…the North West Passage, connecting the Atlantic and the Pacific across the top of North America. But Franklin and his expedition of 128 men disappeared in the Arctic ice. “Years later, traces of the expedition were discovered along the coast of King William Island. 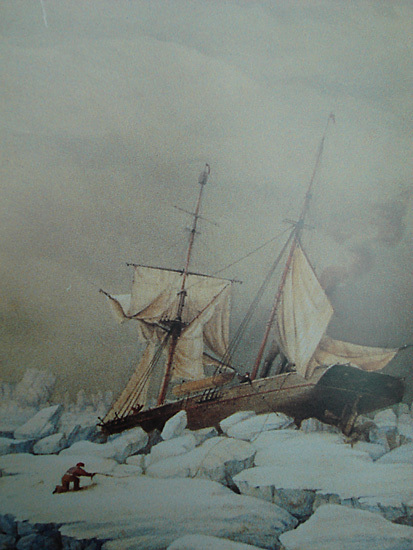 After the ships were frozen into the ice and Franklin himself had died, the crew had marched south towards Canada under the command of Francis Crozier. One after another they perished on the journey. “The only account of the expedition ever found was a brief and tragic note buried in a rock-cairn on King William Island shortly after Franklin’s death but evidence from the bodies and the bones indicates that some overcame the final taboo and resorted to cannibalism. Ignorant of the Arctic, badly equipped, contemptuous of the Inuit, the entire expedition was swallowed by the ice. What happened during the disastrous expedition? What did the men do and see? How did they face the final conclusion in the ice? Based on Winteriser; an original piece for piano by Simon O’Connor, inspired by Schubert’s Die Winterreise; Tásc is Tuairisc is a dark narrative which traces a journey into madness. "Winteriser is a minimalist piece for piano comprised of a slow progression of open ended cords. The piano is played with undampened strings so that each note is sustained for a long period after it is played. As the cords progress they interact with the fading notes and resonate to create a tense funereal atmosphere." A chanting dirge adds dark atmospheric, intonations which unfolds in a narrative which becomes progressively claustrophobic as it describes a mind closing in on itself. Intrinsic to the unfolding narrative of Tásc is Tuairisc is the psychological journey of the 129 members of the Franklin expedition. How did they deal psychologically with their predicament? What effect did the immensity of the challenges of the environment they found themselves stranded in, have on their minds. In an environment which exists on the very edge of survival how did the collective and individual mental state develop? There can be little doubt -and testimony of many explorers confirms this- that the world closed in on these men mentally; that depression and a sense of doom descended on the group both individually and collectively. Reading Ultima Thule, Jean Malaurie’s book on the explorers and natives of the arctic, the relationship between man and this harsh environment leaves a fascinating impression. The native view of the arctic is rooted in a shamanic comprehension of the universe and their place in it. Stone Age hunters, their struggle to survive was almost like barter with nature. Nature: arbitrated by countless spirits of the dead; the elements; each and every animate being and inanimate object; gives and takes. When it gives it must be appeased by the Inuit who has prospered from its generosity. This was how the Inuit rationalised their relationship with nature and although they tried to maintain some control over this relationship with a complex system of taboos, they accepted that they could only survive by working with their unpredictable environment. The explorers viewed the world they found themselves in very differently. They saw it as savage and utterly inhospitable. They had no respect either for the environment in which they were immersed or the Inuit’s view of their world. In their imperialist mindset they could not countenance living off their environment as the Inuit did. They represented the ultimate in human development and they would actually bring an oasis of this civilised world with them into the wilderness. Military discipline and ceremony, fully equipped and provisioned with every conceivable want, were the standard organisational model of 19th century exploration. In this way, when their umbilical cord to civilisation became separated after they were trapped indefinitely in the arctic ice, their sense of loss was profound. They must have felt betrayed by their technology and defeated by the environment. Betrayed by their ordered civilised world, they in turn would betray the most entrenched scruple of civilisation when starvation finally drove them to eat human flesh. In a very real sense, unlike the Inuit, they saw the environment as their enemy and this is the key to the psychological state of the expeditionary crew. This colossal sense of loss and inevitable disaster is the building theme in the music of Tásc is Tuairisc. The apprehensive sounding piano piece is added to with vocal chants and melodies that bring this descriptive piece in stages from the point of uncertainty at the stage of departure into unknown terrain, through the travails of the journey and the impressions of the arctic, right through to the point of defeat when death and hunger take the ultimate toll. The events on King William Island resounded around the Victorian world, where the suggestion that a Royal expedition -led by reputable officers of the royal navy- could have ended in cannibalism caused a sensation. The chief reaction was denial and outrage followed by a sustained campaign, involving the media and high profile personalities, to clear the expedition of any “wrongdoing”. After all; it could not be countenanced that the empire’s finest and most noble could betray the principles of the civilised world so completely.